Apache, Jigsaw and Tomcat compete for benchmark glory. Cleaning house—moving to PostgreSQL one step at a time. OSDL offers open-source developers an invaluable resource. Dealing with pesky .docs with some lean and clean word processing alternatives. Linux Box and Palm—sure they're different but that doesn't mean they shouldn't talk to each other. 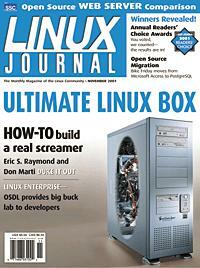 Teaming up with hardware experts to build a couple of dream Linux machines. The results are in—read 'em if you dare.